In late 2001 and early 2002 we obtained five new instruments (listed below) with our New Opportunities Fund grant from the Lottery Commission. Along with the telescopes, SCS Astro also generously provided us with £350-worth of extras. At the simplest level, all reflecting telescopes involve the use of mirrors to focus light rays (and lenses at the eyepiece), whereas refracting telescopes rely purely upon lenses. The basic characteristics of different optical configurations are charted below, starting with a common one used by most amateur astronomers, the Newtonian. (Information from Illingworth, 1994.) The refractors follow, and then some telescope manufacturers and suppliers. 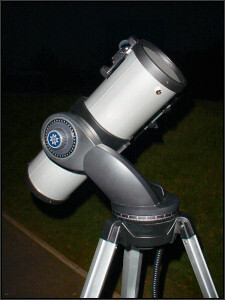 Benefits Eyepiece mounted on the side of the tube makes the small-primary Newtonian convenient to use for amateurs. 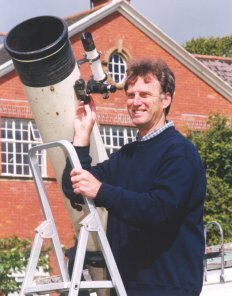 Drawbacks Eyepiece mounted on the side of the tube makes the large-primary Newtonian inconvenient to use for professionals! 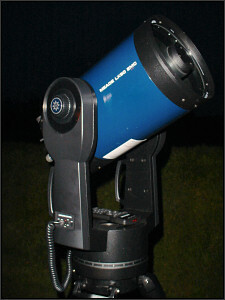 Benefits Compact optics make the telescope portable and easy to mount; it is convenient for amateurs, and quite popular. Drawbacks Small field of view, primarily due to coma. Benefits In the 'aplanatic' Gregorian, coma effects and spherical aberration are eliminated because it uses an ellipsoid primary. Drawbacks In the 'aplanatic' Gregorian, a small field of view (limited by astigmatism) is the result of using an ellipsoid primary. Notes First compound reflecting telescope. Notes - Telescope is 'catadioptric': correcting plate is a meniscus lens (deeply curved). - The diagram above illustrates Maksutov-Cassegrain optics; Newtonian and Gregorian configurations are also possible. Benefits - The telescope is 'catadioptric': the correcting plate eliminates spherical aberration. - The optics provide an extremely large field of view, as illustrated above. Notes Any telescope in which light emerges along the polar axis; this means direction is fixed as the observed object follows its path across the sky. Thus, the object can be analysed by large pieces of stationary equipment, set up at the focus. Benefits Upright image, due to long-focus object lens and powerful diverging lens at eyepiece. Notes - Inspiration came after witnessing Hans Lippershey's 'magic tubes'. - Up to 30x magnification. Benefits Larger field of view and greater magnification than Galilean optics can provide. Notes Inverted image, with more powerful object lens and and another convex lens at the eyepiece.